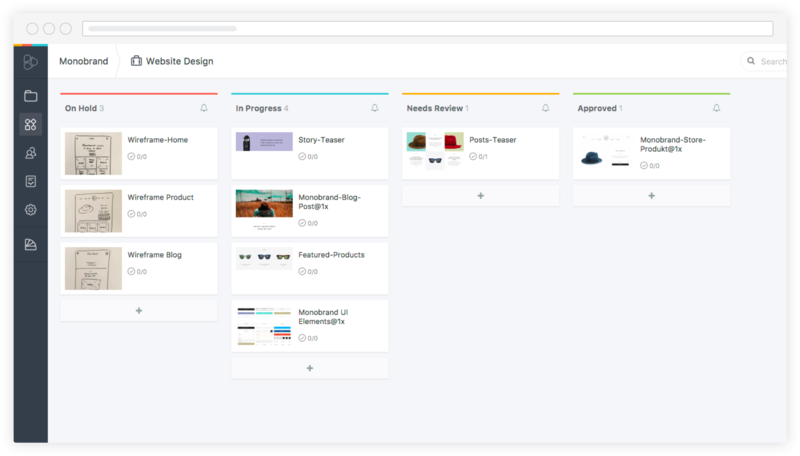 The Kanban board is your best friend during the design process. It takes you from concept to roll-out, while giving you a complete overview of all material, production statuses, and asset owners in the same process – all in one place. Set statuses to assets, enabling a more fluid working process. You'll be notified when an asset changes status – providing your team with the tools to understand the big picture – the process of the project, from start to finish. With Workflow, we allow you to move your asset to the "Approval lane," allowing the right person to approve it. Finish your work and drag-and-drop it. Let the project manager, or anyone fit to make the final decision, do the rest. Assign coworkers ownership of assets and certain statuses, or simply hand them personal tasks. Just write your to-do list with tasks and assign them to your team. They'll be notified when they have new tasks to manage. Create new projects based on predefined Workflow templates where all tasks and ownerships have already been defined. It's like magic. Create a new project, choose your template, and go on a well-deserved break. Simplify your life and save time. Try out Frontify Workflow now.